As sorcery is a big part of the show, many magical relics have turned up. Here is a brief list of some of them. This talisman is actually the eye of Odin, one of Oberon's children. It was taken from him and placed into a gold setting, presumably when Oberon banished his children to Earth for a thousand years. It brings out the inner nature of it's wearer, often with disasterous results. It was used by Fox, the Archmage, and Goliath; and each time trouble arose. It was later reclaimed by Odin. The Phoenix Gate is a doorway through time and space. When the holder utters the activation spell (see above), the gate takes him/her to whatever place and time the holder is thinking of. The disappearance of the holder is most spectacular, as he/she appears to vanish in a ball of flame. It was used several times throughout the course of the show, sometimes with good results, sometimes with bad. In the end, Goliath cast the Gate into the timestream to prevent it from ever being used again. This ancient spellbook contains the spell that froze the gargoyles in stone, the spell that Demona used to turn Goliath into a mindless slave, and many others. 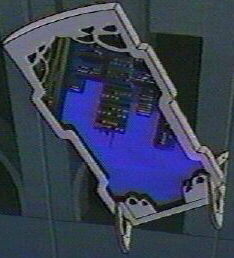 It was owned by the Magus, and later found it's way into Xanatos' posession. It was taken from Xanatos by the gargoyles, and later from them by the Archmage. The Archmage consumed the book (and thus it's power). It was destroyed along with him. This seemingly innocent mirror is actually a relic of the fey. It is infused with fey magic, and allows Oberon's children to use it as both a portal and a lens for their powers. It was used by Puck to turn all of the humans in Manhatten into gargoyles (and the Manhatten clan into humans). The spell was later reversed, and Puck used his magic to force Demona to become a human by day in order to punish her for enslaving him. She was so startled she let loose a high-pitched scream, shattering the mirror. It should be noted that Oberon has an identical mirror of his own in his castle. This magic pot can grant immortality when certain ingredients (including the stone skin of a gargoyle) are brewed within. This immortality has a price, however, as it permanently freezes it�s user into a living stone form, much like when a gargoyle sleeps (this is what happened to Owen Burnett's hand). After it's failure to grant him immortality, Xanatos melted the cauldron and used the magical metal in the construction of Coyote (Version 4.0).